Today's topic: abortions for really stupid reasons. I want to be clear that these are not the majority of abortions. In fact, most abortion decisions are made under some form of coercion. Others are influenced by medically inaccurate "counseling" from abortion businesses. I am convinced that the type of abortion I am about to discuss is extremely rare. As a pro-woman pro-lifer, these situations are hard for me to wrap my head around. It's usually easy for me to stay non-judgmental, but not in cases like these. How do we reach women who are contemplating abortions for admittedly selfish and irresponsible reasons, without falling into the trap of just sounding preachy? I'm especially interested in reading insights from pregnancy center volunteers and sidewalk counselors. I think this could actually be easier to deal with. We use the same arguments, or course (human dignity and such), without the emotional baggage getting in the way. If the unborn child is not a person with rights, no justification for elective abortion is necessary. 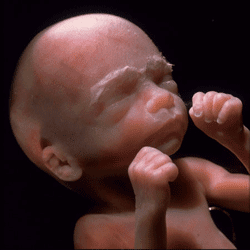 If the unborn child is a person with rights, no justification for elective abortion is adequate. Either way, the reason for the abortion is irrelevant. Ovism: (n) The worship of eggs. 2010: Year of the Pro-Life Woman?